Some us hear things every week that drive us crazy. Most of us don't have a place to let that out! Fortunately for a big mouth like myself, this is my place! Time to Keep It Real on Keep It Real Friday . . .
Hockey Fans, Keep It Real! More specifically, all of you who felt the need to e-mail me your 800-word essay on how The Stanley Cup is better than the Heisman Trophy. (1) You & I will never own Lord Stanley's Cup. 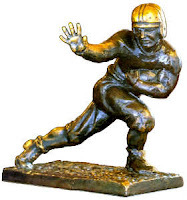 We do however have the opportunity to own a Heisman Trophy. Former Heisman winner O.J. Simpson had to sell off his Heisman to get some extra cash, you think he'll be the only one? Newsflash, he's not the first or the last. (2) This is H1N1 season baby, you think I want a trophy which has been passed around more times than Paris Hilton? For ages people have been sipping brew out of The Stanley Cup, I don't even take a sip of church wine from the goblet, forget The Cup. (3) Lift your left leg in the air, stick out your left arm, and cradle your right arm like you were holding a football. That's the pose! You got it! Anytime I can pose like my trophy, I'm all in. With that being said Hockey fan, I respect the cup, but Keep It Real! Why must Mark McGwire come clean!?!? We should care very little about what the newly appointed Cardinals hitting coach decides to talk about. He doesn't matter. For all non-St. Louis Cardinal fans, do we really want to hear from the hitting coach? Cardinals manager Tony LaRussa should be asked why McGwire? Aside from that question, who cares? So McGwire decided to stay mum on everything involving steroid use, tip of the cap, you don't owe me anything. 30% of the reason why I began to watch baseball even more was because of McGwire (30% Sosa, 30% new Sox ownership and 10% Barry Lamar) Would I want McGwire's tainted name around Albert Pujols? Probably not. Would I want McGwire to become a distraction? Probably not. For the most part, Mark McGwire matters very, very, very little. Get real. Did we ask Tom Cable to discuss his demons prior to accepting the Raiders head coaching job? Did anyone ask Alex Rodriguez about his steroid use the day the Yankees won their latest world championship? 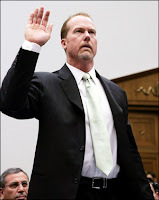 Mark McGwire is what he is, we've already found him guilty in the court of public opinion, so I ask you. . .What would him coming clean do for us? For "Guy who insists" get over it. Keep It Real! I just can't get excited about The NBA. It's November 11th, I'm in full blown football mode, college and NFL. I can't focus on the NBA for a few reasons. (1) The teams which will be there in April, are good right now. The Celtics are 8-1, the Lakers are 6-1, the Nuggets are 6-3, the Magic are 6-3, and the Suns are 8-1. All of those teams are no joke and will be there in the end, no surprise. (2) The Rays stunned the baseball scene a season ago, the Cardinals were in the Super Bowl, anyone like that in hoops? No chance. In a game dominated by stars, LeBron, Kobe, Dwayne Wade, Chris Paul, the chances for a Tampa Bay Rays or Arizona Cardinals to shock us, just isn't there. (3) I'm not going to miss anything if I don't tune in till February, I can still watch this game for four more months. For a season that starts in October but doesn't end till June, I'm not going to buy in anytime soon. I love basketball but the season is too long and too predictable. I love the Celtics and I like watching regular season games if I stumble on it, but I'd much rather watch Cincinnati play football on a Friday night. Keep It Real, the NBA doesn't have much to offer till the new year. The Philadelphia Eagles did something important. They weren't sure where to put Michael Vick, much less how to use him, but they did give him a place to be. Vick was toxic till the Eagles, McNabb, Reid, and ownership put their necks on the line to bring this guy in and give him some kind of a shot. In recent days, coach turned mentor Tony Dungy has said Buffalo may give him a chance next season, amongst many other teams. You know why those owners will? Because Philadelphia did. If the Eagles had never let him on their team, he'd be playing flag football right now. It only took one owner to take a chance and allow him an attempt at making good, now the door is open. Michael Vick can never say word one about playing time in Philly, because it just wouldn't be right. Vick owes something to Philadelphia and whomever was responsible for giving him that shot. Here's a guy who can still make something of himself in this league, this jury may still be out, but as far as him playing in the league? Well that is going to happen. Someone give Reid, McNabb, and the Eagles their due! Keep It Real! I just wouldn't spend the $54.99 I know boxing is making somewhat of a revival. In fact, I enjoy the sport a great deal. However, I can't justify spending $54.99 to watch an evening of fights capped off by Manny Pacquiao vs. Miguel Cotto. Can't do it. There are people who can and will do it, my buddy Joe for instance. As for me? Won't do it. This Saturday night, Pittsburgh vs. Notre Dame on national television for $0.00. Which is a better deal? 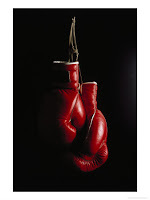 No one argues that boxing is in the same league as football, basketball, baseball, or even hockey. It hangs around with horse racing and poker, in a niche. The difference? We have to pay $54.99 to watch it. I'm not saying if it was cheaper I'd pay, I'm saying I'm not paying at all. If it was on my basic cable, then hell yes I'd fire up the 42-inch flat screen and watch this thing, but it isn't. I won't pay to watch Wrestling, MMA, Ultimate Fighting, or Boxing. For the most part, I wouldn't mind if they showed the fights on regular television and built up more of a following. Maybe this is the road back, maybe I'm not the one to decide but I can tell you I wouldn't pay, and many people wouldn't either. Could that be why Boxing isn't close to as big as it once was? Probably so, people aren't paying $54.99. Keep It Real! For more LynchyRightNow you can follow my tweets, and hear The RightNowPodcast new episodes every Thursday night. Thanks for reading!